Simple to use ... just pull the balloon neck through the disk ... and its sealed. Nothing to it! Bundle several together for a balloon bouquet. Hooks to any string or ribbon for quick, easy decorating. 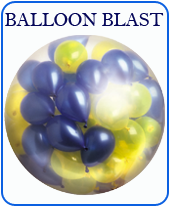 Great for creating arches with helium filled balloons. ZIBI-FIX automatic plastic seal for all rubber balloons of 10'' to 14''. For decoration and advertising.